Panasonic has a reputation for manufacturing high-quality home appliances. Therefore, it comes as no surprise that the Panasonic SD-YD250 is one of the best bread machines on the market. However, unlike other top rated bread machine brands, Panasonic appliances are reasonably priced for the dozens of features they pack. The Panasonic SD-YD250 is relatively compact but can still bake a 2.5-pound loaf thanks to its large removable pan. The bread machine bakes bread with consistent color, robust rising and better crust. Other standout features of the Panasonic SD-YD250 include bake without kneading, sandwich setting for softer crusts and a yeast/raisin timer. You can tweak different settings on the LCD and Control Panel to make various types of loaves, from crispy French baguettes to zucchini bread. The Panasonic SD-YD250 Automatic Bread Maker offers all the options a home bakery would require to bake different types of bread. With this bread machine, you can bake cakes and standard loaves of bread, which you then cut into the exact shapes you want. You can configure the machine’s setting to end up with open, crusty or crisp textured bread. The machine also has six cooking cycles: Cake, Pizza, French, Multi-Grain, Wheat, Whole Wheat and Basic. With the Panasonic SD YD250 bread machine, you can make bread with different ingredients, including pieces of dry fruit, nuts, dates and raisins. The unit has a handy beeper that will alert you when it’s time to add ingredients after the dough has been mixed so they are not pureed. After adding the ingredients and the bread is baked, you will see the dates, raisins, etc. With a capacity of 2 ½ lbs., this bread maker will handle most household bread baking needs. You can decide on the type of crust you would want at the time of baking. The unit allows for three crust options; light, medium and dark. The Panasonic home bread maker has no viewing window. While this may seem like a negative, it is actually a plus. The lack of a window ensures that heat is evenly distributed inside and does not escape from the unit. As a result, your bread will be baked evenly. One of the challenging steps of baking homemade bread is knowing when to add yeast. The SD YD250 Panasonic bread maker eliminates this problem for you. The unit allows you to add yeast from a dispenser on the top at the right time to ensure that you that end up with the perfect bread all the time. The bread machine can also bake perfect non-yeast flatbread or can be used as a non-baking mixer. For example, you can use it to make croissant mix, pizza base mix and even focaccia dough. The Panasonic bread machine has a rapid baking cycle, which you can use to bake bread in just about two hours. Generally, you will want to bake using the standard settings for the best results. When the unit is set to use the rapid setting, a multigrain loaf will be ready in three hours instead of five. However, if you are really in a rush, the extra hours shed will probably not make much of a difference. The Panasonic bread machine features a 13-hour delay time, which you can use to prepare your bread mix in advance and then cook it later. This feature will come handy when if you usually prepare breakfast bread the night before or the evening loaf before you go to work in the morning. The Panasonic SD-YD250 comes with a removable pan, measuring cup, measuring spoon and a single kneading blade. The unit is also sold with a recipe book with over 40 breads and dough. Moreover, it is not difficult to find recipes for Panasonic bread makers. With some bread machines, you have to try to dig the baked bread out of the machine using the stirring paddle mechanism. The result? The bread may end up getting damaged at the bottom. With the Panasonic SD-YD250, removing the bread simply requires you to grab onto the inner bake pan’s wire handle to remove the pan from the machine. From there, slide the bread out onto a cooling rack or cutting board. The bread machine has a nonstick coating that gets the bread to slide out easily. The Panasonic SD-YD250 and the SD-RD250 bread makers are similar in many aspects. Below, we will look at their main differences. First off, the Panasonic SD-RD250 comes with a fruit and nut dispenser. 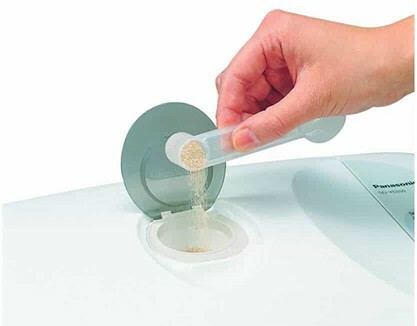 The dispenser can be used for herbs and other dry ingredients. With other bread machines, you will be alerted, usually by a beep, when it’s time to add the fruits or nuts. With the SD-RD250, the fruits and nuts are automatically added. This feature is useful if you are making many loaves of bread. You can make two types of loaves with this machine; M and XL and two crusts; light and dark. One thing that’s pretty bland about the SD-YD250 and the SD-RD250 is their appearance. They’re both pretty dull looking. Unless you look carefully you might not know which model you’re looking at. Both come only in white with little trim or other decoration or color offsets. Apart from the similar color scheme, neither model has a viewing window. Fortunately, they’re both much better than they look where it counts. Each hits a mid-range sweet spot for size. The SD-YD250 measures 13 3/8″ wide by 14″ high by 9 1/16″ deep and weighs 15 lbs. For comparison, the SD-RD250 is a slightly different shape: 11 1/8″ by 12 13/16″ by 14 9/16″, weighing the same 15 lbs. The difference likely isn’t enough to sway anyone and both are small enough to fit comfortably on many counters. However, the pan inside the SD-RD250 is a little different from that in the SD-YD250. The latter has a non-stick coating that certainly works well, but the newer model (the SD-RD250) is coated with a diamond-fluorine compound. It provides not just a non-stick surface but one that’s hard enough to resist well the inevitable scraping bread making pans receive. Each model has a dispenser on the top, but the SD-YD250 is for automatic inclusion of yeast during the baking cycle. The one on the SD-RD250 is for automatically folding in nuts, fruits and other dry ingredients. It holds up to about 150 g (5.3 oz). In each case, the auto-release dispenser eliminates the need to set a timer to come back and add ingredients during the baking cycle. That feature would definitely make a difference in my kitchen, though it would be nice to have a model that does both. In my case, the yeast adder is a little more helpful but if you make lots of recipes with fruits or nuts you’ll naturally prefer the SD-RD250. The SD-RD250 isn’t perfect about preventing the fruit from clumping together or sticking to the dispenser. A little flour will help keep the fruits from sticking together and can also make clean up a little easier. That said, the cup is removable and not hard to clean. Selections aside, the whole system could not be easier to use. Both models’ LCDs have large, clear characters and icons; they’re a cinch to read even without my glasses. The buttons and menu style on each model is virtually foolproof – which is saying something in my case. Personally, I prefer the layout on the SD-RD250 a bit more than the SD-YD250’s style, but that really does come down to a matter of taste. Functionally, there’s no difference and neither is at all confusing or hard to decipher. The SD-YD250 is one of the bestselling breadmaking machines on Amazon but the newer SD-RD250 isn’t too bad. Panasonic hasn’t incorporated any of the technology from the touchpad ‘revolution’ in these bread makes. Still, this is true of many bread makers that are otherwise pretty impressive. There are more similarities, but with a few interesting differences, in how you operate either of these Panasonic bread makers. Both models have a row of simple-to-use buttons along the base of the LCD display. One button lets you set the Timer for starting the baking cycle up to 13 hours ahead. If you like to add your ingredients befor going to work or errands for a long time, this is a great feature. The buttons also let you easily select the loaf size desired. The SD-YD250 will bake anything from a 2.5 lb loaf down to 1.5 lb (or less, if you add less ingredients, of course). In the case of the SD-RD250 you get only two sizes: Medium or Extra Large. The SD-YD250 offers three. Also, the RD-SD250 offers only two Crust Types: Light or Dark. Most models offer three. Both models offer a variety of bread types. However, in the case of the SD-RD250 it doesn’t accommodate 100% whole wheat. If that’s a must and the SD-YD250 does not meet your needs, look for another bread maker brand. Neither the Panasonic SD-YD250 nor the SD-RD250 will dazzle first-time buyers with its looks or features. However, both are ultra-simple to use and have a decently varied set of choices. Both are super reliable, house good materials and are well made. The biggest difference between the two models is the dispenser. The one in the SD-YD250 is intended for adding yeast with the other ingredients, dropping it into the dough at the right moment automatically. The one offered with the SD-RD250 is used to add nuts or fruit in a similar way. However, the Panasonic SD-RD250 bread maker is a little more expensive than the SD-YD250, probably because it’s newer and the different dispenser. If you don’t frequently use nuts or fruit in your bread recipe, you might want to go with the less expensive SD-YD250. Check the table below for an overview of how the two Panasonic bread machines compare. Weight 15 lbs. 15 lbs. Well-textured and evenly-made loaves of bread. The color of the crust is even at the top and bottom. Tends to get noisy. If you live in a home where the sound from the other room carries over, you will be a bit disturbed, especially, if you are baking at night. The instruction manual is not that easy to comprehend. You have to pay attention to details if you want your loaves to come out well. You cannot just leave it and find everything magically done. It takes up a whole lot of space in the room. Will not be good for the counter space. The replacement blade is a bit expensive when compared to those of other brands. There is no viewing window on the machine. Therefore, you will not know how the kneading is going unless you lift the cover to see. The bread maker has a built-in yeast dispenser that automatically dispenses more yeast to the dough during the mixing process. Simply measure the amount of yeast you would need for a recipe and dump it into the holder of the machine line. The unit will automatically determine the right time to add the yeast to ensure you end up with great bread. The Panasonic bread maker produces excellent bread in the kitchen. Whether you are looking to bake a small or large loaf, it will turn out evenly-baked, soft and tasty. The Panasonic SD YD250 has a simple and intuitive LED interface that is the central hub of all its operations. The unit also has a removable bread pan with a non-stick coating that prevents bread crust from sticking on it after baking. The non-stick property makes the unit easy to clean. The SD YD250 is great for bread-loving families as it can bake loaves in three sizes: 1.5, 2 and 2.5 pounds. These are all large breads. This is an impressive feat given the unit’s compact size of 14 x 13 x 9 inches. The small size of the machine means it doesn’t take a lot of space on the counter like most high-capacity bread makers. If you live alone and would prefer a smaller bread, go for a mini loaf bread machine. There are also some issues you should know about before purchasing the Panasonic SD YD250 bread machine. 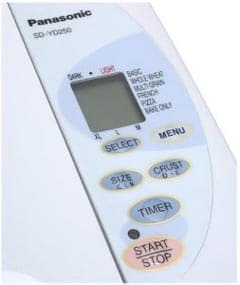 One of the major downsides of the Panasonic SD-YD250 is that it is quite noisy compared to the latest Panasonic bread machines. When mixing and kneading the dough, the machine tends to make whining and clicking sounds. Therefore, if you plan to bake bread at night, you may want to keep the machine far from your bedroom. The bread maker lacks a gluten-free setting. You cannot adjust its settings to make dough for gluten-free bread. The unit also lacks jam and jelly settings. Warming the ingredients may take a long time depending on the dough option (anywhere from 40 minutes to two hours). 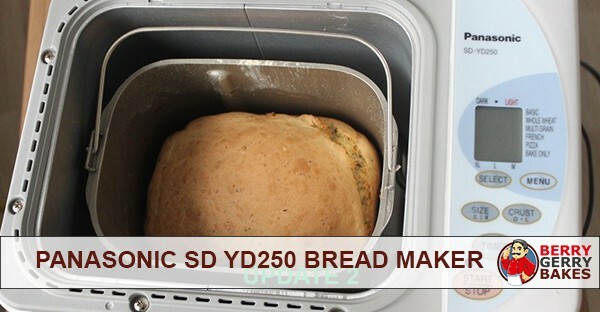 The single-padded design of the Panasonic SD YD250 makes it bake vertically-shaped loaves. If you prefer a more square loaf, you would be better off with a Panasonic BB-HAC10 bread maker.